Invisible Cities is not exactly a collection of short stories, but it reads very differently than a traditional novel. I read it for the first time during my semester abroad; I was taking a class about travel writing, and it was one of the books assigned. I loved it. I used it as the basis for a paper I wrote for the class in which I created my own cities. In the book, each “chapter” has a name such as Thin Cities or Cities and Signs, and although I can no longer find the paper itself, I remember that my cities were called Cities and Love. I was nineteen then, and obsessed with travel and love and poetry. This book was food for my soul. Holding it now, I can still remember where I was the first time I read it cover to cover. My college’s semester abroad program was a bit unusual; the school sent eighty students to a castle in the Netherlands for a term, where four days a week, we would be taught by English-speaking Europeans or American ex-pats; the other three days, we had rail passes that allowed us to travel wherever we liked or could afford to go. I arranged my class schedule so that I had classes only three days a week, leaving one day when all my friends were busy and I could do my reading and writing. I needed that time because during that semester, I loved my classes. I never felt like I was doing busy work, but instead, felt as though my professors were offering me a look into a world I had been imagining existed for years, and I didn’t want to disappoint them or myself by being unworthy of that opportunity. I worked very hard and cared deeply what they thought about my ideas. The evening that I finished this book, I was in my bedroom overlooking the moat. The sun was setting and I could hear people heading out to the pub from where I was sitting with the window open. I felt completely disconnected from the world, and at the same time, completely in love with it. I’ve read this book now four or five times, and every time I do, I remember what it felt to be young and naive and stupid and excited about the unknown. I recall that glimpse of independence – of that feeling of being in on a secret with the rest of a more sophisticated world. Every time I read it, I feel a little further away from that girl. I’m reminded of all that was good then, and all that is good now, and inevitably I also remember all of the things that aren’t or weren’t good too, and I am forced to embrace the whole world of change again. It’s hard, but some part of me must love it because no matter where I go, I keep this battered copy of Calvino on my shelf. So I put this book and Instructions on my Christmas list! I hadn’t seen that, so thank you for sharing. I enjoyed reading Binelli’s perspective on the city as a character, and I’m especially pleased he included Invisible Cities, since it really is a masterpiece on the subject. I’ll have to explicate on this in a blog post, because superficially it doesn’t really make much sense, but Italo Calvino has definitely saved my life. His works are so radically imaginative, I just remember when I read both “Cosmicomics” and “t Zero”, thinking something like ‘okay this guy ‘gets it’, someone gets it and makes it sound wonderful.’ It’s like he harvests the beauty in chaos, or points out the serendipitous chance in a seemingly cold universe or something better than the obtusely affected phrases that with my inferior intellect I have to use to describe how Calvino’s fictions make me feel. I haven’t yet read “Invisible Cities”, but will definitely check it out. I think you’re selling yourself short – I find Calvino’s influence on me (specifically), and on literature (in general), to be incredibly difficult to describe, especially to someone who hasn’t read his work – and you do a wonderful job of trying to capture the essence that makes his writing so magical and meaningful to read. That being said, if you do write a longer post on it, share the link? This was such a beautiful post! I hope you’ll link to the next one as well; I would love to read it! Thank you–that means a lot to me as I really enjoy your blog. Yes, I will link you to my next post. Hi, I didn’t know this one. 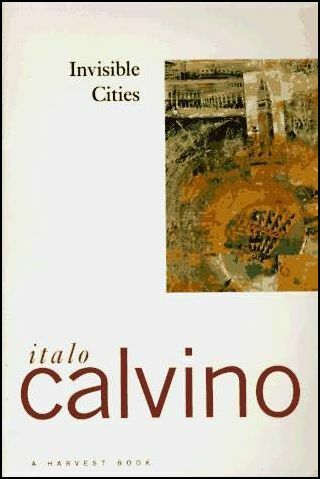 I read others books of Calvino. what is it about? yes, I will read it , thank you.